Fly Fishing, first published in 1899 by English author and diplomat Edward Grey, 1st Viscount Grey of Fallodon (1862–1933), is a book about fly fishing English chalk streams and spate rivers for trout and salmon. It includes reminisces about the author's fly fishing experiences on Hamptonshire rivers. The book was in print for nearly 50 years and has been extensively reprinted in the 21st century. What are the qualities which a man most needs to become a good angler? Let us assume that he starts with keenness, that the prospect of hooking a fish produces in him that feeling of excitement which is the motive for a desire to succeed, is the beginning of delight in angling, and, like a first element, cannot be analysed. ...In angling, as in all other recreations into which excitement enters, we have to be upon our guard, so that we can at any moment throw a weight of self-control into the scale against misfortune, and happily we can study to some purpose, both to increase our pleasure in success and to lessen the distress caused by what goes ill.
Grey was a contemporary of angler G. E. M. Skues at Winchester College, but it is unknown whether or not the two ever met or fished together while attending school. At the time of his writing Fly Fishing, Grey was considered one of the finest dry fly fisherman in England and a master of the Hampshire chalkstreams. Lord Grey of Fallodon published his book at the end of last century. The dry fly was then at its zenith, and the other system [the nymph] was receiving somewhat intolerant treatment. He was the first writer of importance on the dry fly who really knew what the wet fly meant. Himself the best and most devoted dry fly fisherman in England, he thus started unconsciously that restatement of values which Mr. Skues has carried so far. But he did more. He is gifted with the power to write fine prose. There are not many who have acquired angling fame by the publication of only one book. There are few, however: those who readily occur to one are Walton, Stewart, Scrope and Plunket Greene. To that select circle there must be added the name of Edward Grey, for Fly-fishing was his one angling book and it is ranked among the classics. Indeed some go so far as to regard it as the finest contribution that has ever been made. Pranava Books, 2009. Reprinted from 1920 edition. Gingrich, Arnold (1974). The Fishing In Print-A Guided Tour Through Five Centuries of Angling Literature. New York: Winchester Press. ISBN 0876911572. Herd, Andrew Dr (2001). The Fly. Ellesmere, Shropshire: Medlar Press. ISBN 1899600191. Hayter, Tony (2002). F.M. Halford and the Dry-Fly Revolution. London: Rober Hale. ISBN 0709067739. Halford, F. M. (2007). Schullery, Paul, ed. Halford on the Dry Fly. Mechanicsburg, Pa: Stackpole Books. ISBN 9780811702720. Black, William C. (2010). Gentlemen Preferred Dry Flies--The Dry Fly and The Nymph, Evolution and Conflict. Albuquerque, NM: University of New Mexico Press. ISBN 9780826347954. ↑ Black, William C. (2010). "G.E.M.Skues Picks up the Gauntlet". Gentlemen Preferred Dry Flies--The Dry Fly and The Nymph, Evolution and Conflict. Albuquerque, NM: University of New Mexico Press. pp. 101–102. ISBN 9780826347954. 1 2 Callahan, Ken; Morgan, Paul (2008). Hampton's Angling Bibliography-Fishing Book 1881-1849. Ellesmere, England: The Medlar Press Ltd. p. 121. ISBN 9781899600878. ↑ Hills, John Waller (1921). 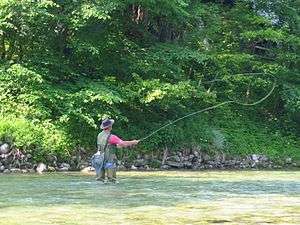 A History of Fly Fishing For Trout. London: Phillp Allan & Co. pp. 217–18. ↑ Robb, James (1945). Notable Angling Literature. London: Herbert Jenkins Limited. p. 80.